Rowena Duncan is a thoroughly modern girl with big plans for her summer—until she catches her boyfriend making out with another girl. 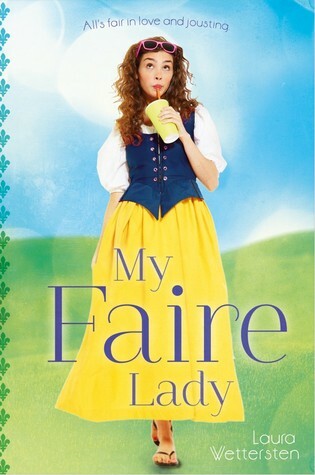 Heartbroken, she applies to an out-of-town job posting and finds herself somewhere she never expected: the Renaissance Faire. As a face-painter doubling as a serving wench, Ro is thrown headfirst into a vibrant community of artists and performers. She feels like a fish out of water until Will, a quick-witted whip cracker, takes her under his wing. Then there’s Christian, a blue-eyed stunt jouster who makes Ro weak in the knees. Soon, it’s not just her gown that’s tripping her up. Trading in the internet and electricity for stars and campfires was supposed to make life simpler, but Ro is finding that love is the ultimate complication. Can she let the past make way for her future? Why I'm waiting: Although I find the cover hideous the premise sounds cute and fun, something I've been needing recently! Definitely can't wait to check this one out! Nice pick! Totally new to me. Not sure it's my kind of read but still hope you love it!